In a democracy, elections are critical to maintaining a free and vibrant society. However, the political process in the United States is a lot more complicated than casting your ballot. Just consider a presidential election. With so many candidates starting out, how is it determined who ends up on the final ballot? Part of the answer lies in caucuses. A caucus is a special gathering for political parties to decide which candidates to support during a general election. Most of the time, caucuses are held during a presidential election in order to whittle down the pool of candidates. Caucuses determine who the most popular candidates are for each political party, and these candidates receive votes from delegates. In order to attain the nomination from the party, a candidate must have the most support from delegates across the country. How Is a Caucus Different From a Primary? While caucuses are important, they are not the only way candidates are selected. Many states use a primary system instead of caucuses. Each state can choose its own system based on what works for its voters. Primaries are structured like general elections. Voters go to their local polling place and cast a vote for their preferred candidate. All ballots are secret, and the entire process is over quickly for voters. The results are tallied, and a winner is announced. Caucuses are much more interactive, and they are not private. Voters can expect a much longer process if they attend a caucus, and the climate is much more politicized. This is largely because caucuses are run by the political party itself. Primaries, by contrast, are operated by the state. Despite these differences, both primaries and caucuses are accepted ways for delegates to determine which candidate to support in any given state. Since caucuses are run by each political party, voters must be registered with that political party in order to participate. This means that it is not possible for voters to attend both caucuses, but voters can usually change their official registration at the door of their local caucus. Since voting is not private, representatives for each candidate are usually on hand to try to woo potential voters. Throughout this process, voters congregate with others who support their favorite candidates, and the crowds can shift and flow as needed throughout the night. Republicans and Democrats have somewhat different approaches to the caucus system. In a Republican caucus, after the lobbying is over, voters are asked to raise their hands in support of their candidate. The candidate with the most votes wins the delegates. Democrats have a system with more give and take. There are usually a series of votes until only the most popular candidates remain. In this manner, Democratic caucuses rarely have a winner-takes-all approach, and even candidates in second place can still earn some delegate support based on their performance. How Does a Caucus or Primary Differ from a General Election? Caucuses and primaries may be different, but they serve the same purpose. Each one is operated to determine which candidate will run for the general election. As each state holds its primary or caucus, the front runners become more apparent. More candidates begin to drop out of the race until each political party counts its delegates and announces its official nominee for the general election. A general election is run between the two main party candidates. Caucuses and primaries ask voters to pick between candidates in the same party, but a general election seeks to determine the favorite between either party. The winner of a general election will ultimately become president of the United States. How Did Caucuses Come To Be? Caucuses have a longstanding tradition in the American political system. By many accounts, the term caucus was actually first used in America prior to the revolution. After the United States was established, caucuses were used by political parties to determine which candidate would run in the election. These caucuses were much more closed off back then, and candidates were selected mostly by political leaders. In fact, it was the exclusivity of the caucus that led to the invention of the primary. Primaries were developed by states to give citizens more opportunities to participate in the political process. Caucuses are used in 13 states and several American territories while the rest of the country now uses primaries to select major presidential candidates. 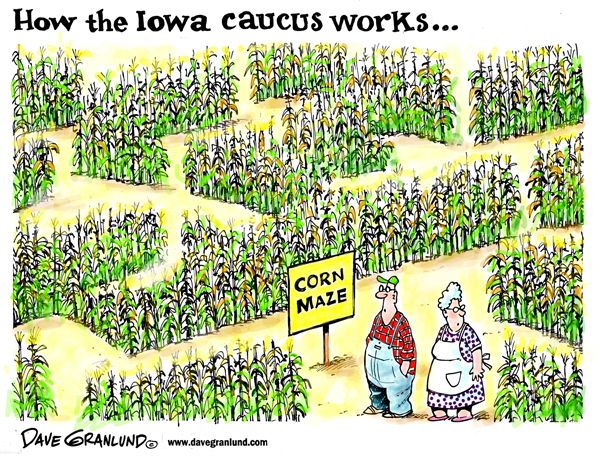 Why Are the Iowa Caucuses So Important? While there are caucuses in other states, none receive as much attention as the Iowa caucuses. The Iowa caucuses hold a place of importance in American politics mostly because they are the first. With caucuses in January or February, Iowa is the first state to vote, which often sets the tone for the rest of the country. Some people may think it is strange that a state like Iowa has so much influence. However, it has been proven that momentum gained in Iowa can easily propel a candidate to success in other states as well. This was first demonstrated clearly in 1976 when Jimmy Carter started his presidential bid. As is explained in this handy video, Carter did not have a lot of campaign funds, but he was able to start a vibrant grassroots campaign that appealed to Iowa voters. His surprise win led him to victory in other states and, eventually, got him to the White House. As unusual as a caucus may seem, each one has an important part to play in the American political process. Whether or not your state operates a caucus, it is helpful to understand what these raucous political gatherings mean to a healthy democracy.